LUXURY TOWN HOME NEAR DISNEY in Kissimmee is an apartment building. Situated 4.3 km from Kissimmee Value Outlet Shops and 7 km from 192 Flea Market, LUXURY TOWN HOME NEAR DISNEY offers accommodation set in Kissimmee. The apartment is 8 km from Plaza del Sol Kissimmee. The apartment is equipped with 4 separate bedrooms, 3 bathrooms, a fully equipped kitchen with a dining area, and a TV. LUXURY TOWN HOME NEAR DISNEY offers a terrace. Fun 'N' Wheels Fun Park is 8 km from the accommodation, while Kissimmee Sports Arena & Rodeo is 11 km from the property. The nearest... airport is Orlando International Airport, 30 km from LUXURY TOWN HOME NEAR DISNEY. 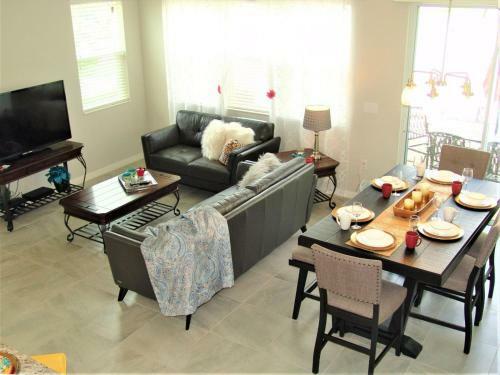 Situated 4.3 km from Kissimmee Value Outlet Shops and 7 km from 192 Flea Market, LUXURY TOWN HOME NEAR DISNEY offers accommodation set in Kissimmee. T...he apartment is 8 km from Plaza del Sol Kissimmee. The apartment is equipped with 4 separate bedrooms, 3 bathrooms, a fully equipped kitchen with a dining area, and a TV. LUXURY TOWN HOME NEAR DISNEY offers a terrace. Fun 'N' Wheels Fun Park is 8 km from the accommodation, while Kissimmee Sports Arena & Rodeo is 11 km from the property. The nearest airport is Orlando International Airport, 30 km from LUXURY TOWN HOME NEAR DISNEY. When would you like to stay at LUXURY TOWN HOME NEAR DISNEY?